Five Hindu pilgrims who were hurt in a major accident in the Himalayas were flown in an IL-76 plane equipped with medical facilities. 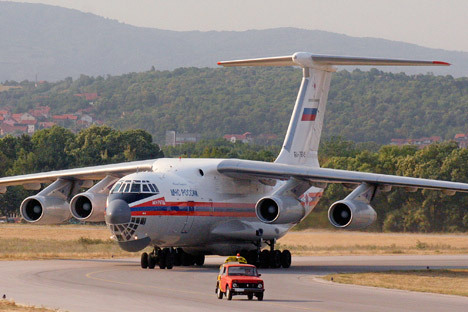 A Russian Emergencies Ministry plane airlifted five Russians hurt in a road accident in the Indian state of Uttarakhand to Moscow, the Russian Emergencies Ministry spokesperson, Alexander Drobyshevsky said. “An Il-76 plane landed at the Ramenskoye airfield near Moscow. It is equipped with three medical modules in which the patients had been placed during the flight,” he said. Ambulances took them for treatment to Moscow clinics straight from the airfield. A minibus with 13 Russians fell into Bhagirathi River in Uttarakhand, on June 10. All of them were Hindu pilgrims who were on a private trip to the Gangotri village, a major pilgrimage centre. Two Russians, a man and a woman, died in the accident. One person is still missing. Four pilgrims refused to go to hospital and continued their trip. Another Russian woman has returned home by a regular flight. The Indian authorities swung into action immediately after they were told about the accident by the state government. Soon after the incident, on the request of the Indian Ministry of External Affairs, officials from the Defence Ministry reached the spot and supervised rescue operations. The injured Russians were first swiftly taken to Jollygrant hospital in Dehradun, the capital of Uttarakhand on helicopters and then to New Delhi by a special Indian Air Force flight. In the capital, they were admitted for treatment in a super-speciality hospital. During his visit to New Delhi last month, Russian Deputy Prime Minister personally thanked Indian Prime Minister Narendra Modi for the swift rescue operation. Last year, the state of Uttarakhand was hit by devastating floods, which claimed the lives of at least 5,700, according to official figures. The numbers are believed to be much higher. The Indian armed forces evacuated more than 110,000 people from the state. Environmentalists said roads constructed in haphazard style, new resorts and hotels built on fragile river banks and more than 70 hydroelectric projects in the watersheds of the state led to the disaster. There was no official warning from either the Indian or Russian authorities to avoid travelling in the region, but road safety in India’s mountainous states remains a major concern with a large number of private companies operating tourist buses at night in the states of Uttarakhand and Himachal Pradesh.